sei lifestyle: Holiday Craft Kit Giveaway! It's giveaway time! This month, we're going to let the winner choose which Club SEI November kit they'd like. Both kits are fun, festive, and full of goodies. Which would you pick? Maybe the paper-crafting kit with wreath kit, tag kit & gifting ideas or would it be the card-making kit with holiday card ideas galore? To enter, just follow the simple directions below. You can enter using your e-mail or facebook. It will ask you to leave a comment. Please remember to do that. There is also a bonus entry. Good luck! I would probably choose the first kit because I would love to make the wreath and the tags are harder for me to make than cards. I'm up for the challenge. Very, very hard choice but I think maybe I would choose the first one. It looks like it's really versatile and I could use it to make decorations, the wreath is beautiful. i'd choose the card kit because there are so many different colors and cards! The wreath, because I will get the Card kit, I belong and get the Card kits! I think I would choose the first one. I like the variety of paper crafting items! I would choose the Paper crafting kit because I LOVELOVELOVE the little deer, the prints are nice, the awesome assortment of tags and best of all, the AWESOME wreath to make!! The wreath and the deer are the two biggest deciding factors though!! Thank you so much for the chance to win this amazing kit! I would have hours of creative fun with it! I would chose the card kit. I love the little birds. The card kit looks fabulous but that wreath is calling my name. I'd have to go for the paper crafting kit this time. I would choose the card kit. It looks so fun and awesome. Probably the wreath but both cute. Love crafty decor! Think I would get the first kit! All look wonderful! Would like card making kit. I would pick the paper craft kit because those tags are just plain fun! Gorgeous kits! I think I prefer the card making kit since I usually make cards! Beautiful kits! I think I prefer the card making kits. I would choose the paper crafting kit! I love to scrapbook and make cards. Lovely kits, I think I will pick the first kit. I would pick the card kit since I already receive the paper crafting kit. You can always find a use for a card. I love them both but I would probably choose the card kit because I love making Christmas cards. I love SEI so much, I can't wait to take my card class at CKC Seattle! The tag kit looks awesome. Love it, I could use them for tags on gifts or tags for scrapbooking. Thanks. I defintely would choose the card kit because I am mostly a card maker. Thanks for the chance to win such a beautiful Christmas card kit. Christmas is my favorite time of the year. They're both gorgeous-but I really need the card kit. My card making mojo has disappeared this year. Would love to send my friends festive ,happy cards for Christmas. I would probably pick the first kit to make the wreath as a teacher gift for their classroom door. I would pick the First kit, which all of them are very versatile and would make some pretty amazing crafts from. I would like to try my first SEI papercrafting kit. The wreat looks extra cute! I like the tags kit. I really like the wreath and the colors. Its a tuff choice but I'd choose the first kit. Good luck everyone! I make lots of cards...but I really love that wreath so I would pick the first kit! It's a tough decision, but I'd have to choose the paper-crafting kit. I love that wreath and would love to have it hanging in my home for Christmas! The First kit! Love it! Would love to win. Great inspiration! I like the first kit better. More my style. Both kids look like a lot of fun! I guess I'd choose the paper-crafting kit, just because it looks like it would make creating tags a lot of fun! I'd choose the papercrafting kit! Love the traditional colors. I would love one of these kits! It would be hard to chose. Ooh, maybe the card one?! i like the card making kit. can't have enough cards! I would choose the paper crafting kit. The tags look so beautiful, they are gift themselves. 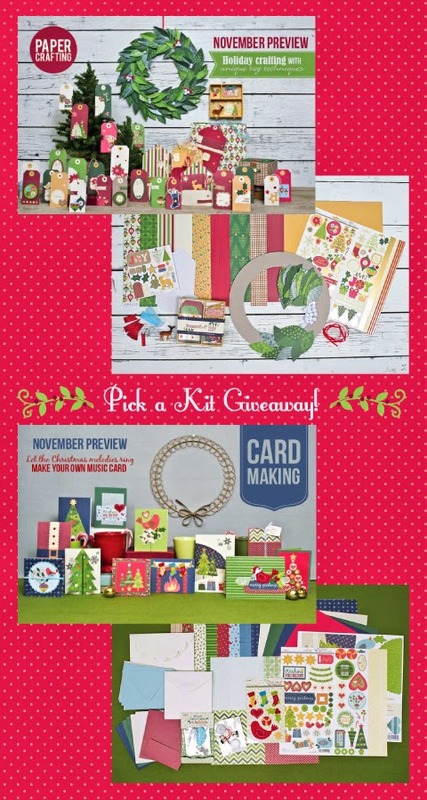 Already getting the card kit - but, would love to win the paper crafting kit. That would be awesome!! I would love the card kit. I am fairly new to card making and these would be a perfect just start to cards for Christmas! It would be so neat to have to paper crafting kit. Thanks for the chance to win. The first kit! I want to get crafty! I would like the paper crafting because I want to make lots of tags for Christmas. I would like the craft kit because I want to make a lot of tags for Christmas.